Have you ever had so much fun birdwatching that you forgot to eat, or to sleep? Here's a great, original design for everyone who loves birding. A spoof of highway information signs, three simple icons represent eat (knife and fork), sleep (person on bed), and bird (a bird hide or blind). 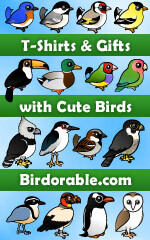 This makes a perfect, unique gift idea for any birder. To order by phone, call toll-free at 1-877-809-1659 from Monday - Saturday 9:00am - 9:00pm EST. You'll need to note the Product Number 030-337687127 to make your order.